We saw the first clues hinting at an Apple car-building project back in February. Rather than information leaking out of Apple directly, it was evident that the Cupertino tech giant had become involved in a 'hiring war' with electric car pioneers Tesla motors. 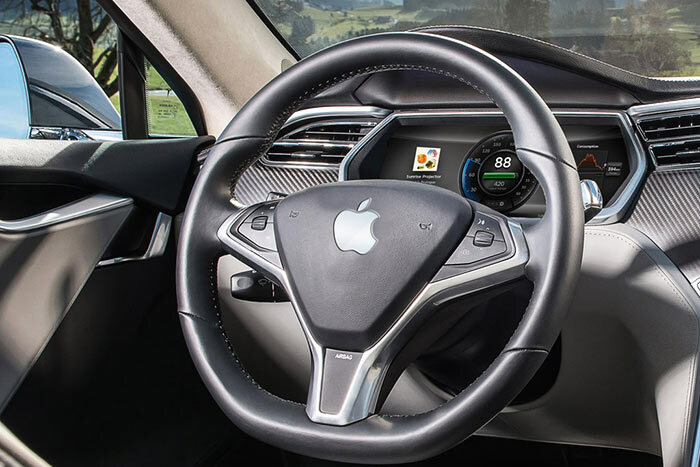 Putting two and two together and adding a few morsels of insider talk, the media concluded that Apple was gearing up to enter the electric automobile business, possibly with technology-packed self-driving cars. The Wall Street Journal has recently got an update about the Apple car project from "people familiar with the matter". It indicates that Apple has spent the last year investigating the project, its feasibility and legal/commercial matters and is now committed to the project. With everything now in place internally, and any possible regulatory obstacles considered, Apple has decided to accelerate its efforts to get the car to market. Cupertino has already a 600-strong team working on the project but project leaders have now been given the green light to triple the workforce, to get things rolling. The indications are that the first car won't be fully autonomous, despite Apple hiring such experts already. Self driving cars are part of a longer term plan, say insiders. So we might expect the first cars to be fully electric, but packed with driving tech assistance, rather than a system that takes over driving duties. Apple's targeted ship date of 2019 isn't necessarily going to be the date in which consumers can buy these cars, says the WSJ. With oil prices and therefore petrol prices going down recently, it is thought that electric cars have become less attractive to the buying public. However, with better batteries and longer ranges supported by electric cars, alongside future oil price increases and government encouragements to go electric, the tide may turn by Apple's 2019 product shipping target. Fanboys patent expensive iTunes apps unix jailbreak android proprietary iPhone boutique windows NeverWhenSteveJobsWasAlive. There you go Hexus peeps, a few buzzwords to get your Apple rants flowing. Seriously though, which element of all existing cars do we think Apple will file a patent for on the back of this? Can you imagine how many workers will kill themselves in their car plants from being grossly under-paid and working in abysmal conditions? But people will still pay twice the competitions price tags to get the Apple logo, even though their cars will probably decide where you can drive and how fast….